A newly planted or transplanted tree can require up to two years or more of proper care. The length of time it takes for the tree to fully establish itself is usually determined by its size. The larger the tree, the more maintenance will be required. Trees can lose some of their root system when transplanted, which can lead to a condition known as transplant shock. The stress of the replanting can make the tree more vulnerable to weather and soil conditions, as well as pests. It can take several years for some trees to fully recover from the planting. During this period, it is extremely important to inspect the tree on a regular basis, and take whatever actions are necessary to ensure its establishment and growth. 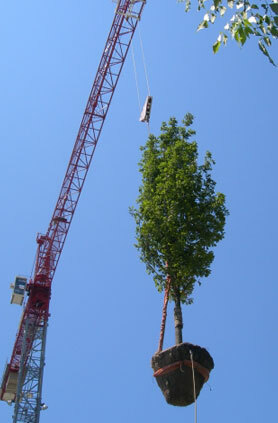 Newly planted or transplanted trees require a bracing or staking system. A newly planted or transplanted tree should be staked for at least a year (two years if you live in a particularly windy area) until the tree is able to re-establish its supporting root system. The staking should allow the tree to move slightly as it is this movement that indicates to the tree that it needs to start growing stabilizing roots. The staking should be checked (and possibly loosened) about every six months to make sure it is not too tight and girdling the trunk. It is vital a newly planted tree receives sufficient water. The size of the tree, the type of soil the tree was planted in, and drainage in the area will determine how much water is needed. The most efficient and effective method of watering is a ring or two of soaker hose, or drip line on top of the rootball, connected to a battery operated timer. Typically 15-30 minutes of drip per day (during the growing seasons) is sufficient in keeping the rootball consistently moist. Consistent moisture is instrumental in the trees survival in the first two years of its newly planted life. Do not rely on rain to do the deep root watering the tree needs! Mulching may also be needed to help create an ideal growing environment for your tree. In addition to protecting the tree’s roots, mulch inhibits weed growth and helps conserve water. It also improves the health of the soil. Proper maintenance of a newly planted tree will include periodically removing dead leaves, and dead or broken branches. After a year or two, the tree might need to be pruned to ensure its successful establishment and long-term survival. Avoid over-pruning, which can impact the tree’s ability to generate the energy that it needs. Fertilization if often beneficial for young trees, and can speed up their growth. If your tree has indicators of a nutrient deficiency, test the soil to determine the best way to treat the problem. Trees that have been newly planted are more susceptible to pests such as mites and bark beetles, as well as root diseases. A newly planted tree’s survival will depend on its ability to generate roots. The roots will grow from stored energy in the tree’s leaves, branches and trunk. When monitoring your tree, look for any changes in the plant’s health. Even small changes can impact the tree’s energy-making ability. If you have questions about the condition of your tree, consult a big trees expert. A professional with landscape trees knowledge and experience can tell you what program needs to be followed when transplanting trees.